This is one of our favorite set of feast days! 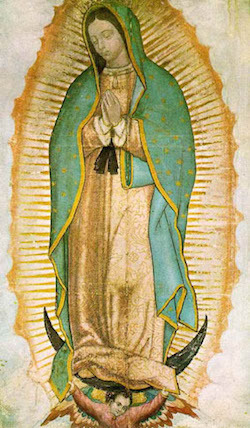 St. Juan Diego is December 9th and Our Lady of Guadalupe is December 12th. 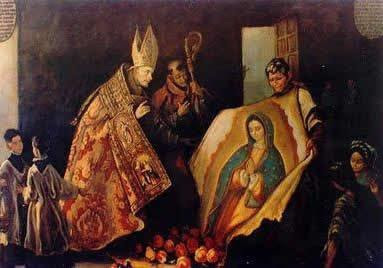 In 1531, Our Lady of Guadalupe (the Blessed Virgin Mary) appeared to a poor, indigenous Mexican Indian named Juan Diego. 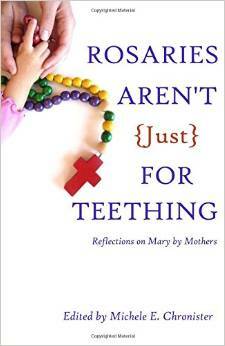 She asked him to tell the bishop that she wanted a shrine built on the Hill of Tepeyac just outside Mexico City. The bishop was skeptical and asked for a sign. 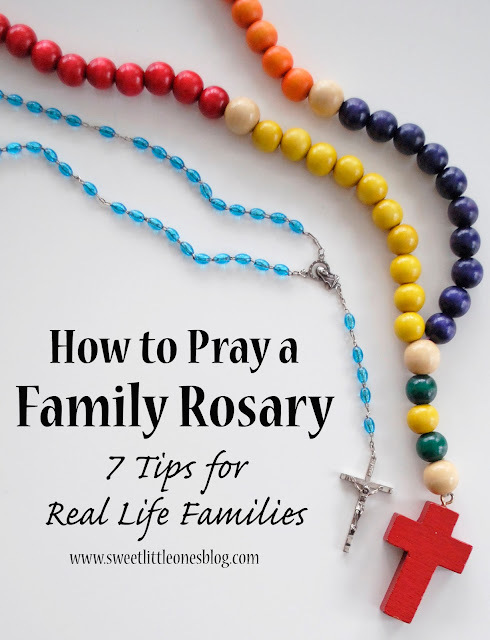 Our Lady then told Juan Diego to gather roses on Tepeyac Hill, which was very unusual because these flowers were completely out of season. He collected the roses and brought them to her where she arranged them in his tilma (or cloak) before sending him to the bishop. Juan Diego's tilma with the image of Our Lady of Guadalupe is still displayed in the shrine today. His tilma was made of cactus and should've disintegrated within 50 years. However, 500 years later it is still there to be seen by the 22 million people who visit the shrine every year. 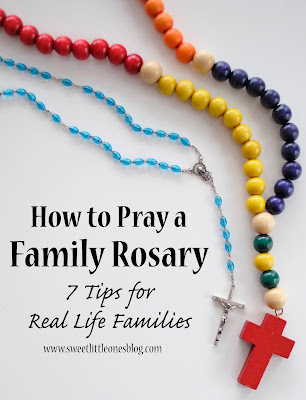 I really enjoy their feast days because I love St. Juan Diego's humility and child-like faith and Our Lady's caring, motherly love. 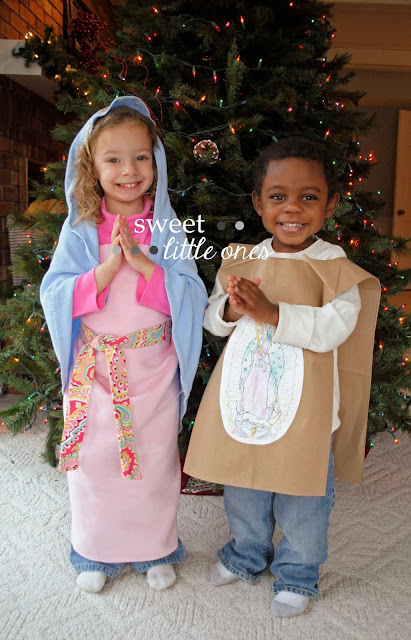 They are wonderful role models of how to love God with all of your heart, mind, and soul. Now, on to how our family celebrates them! Everything we do to honor their feast days is simple and quick - perfect for our busy family (and our little one's attention spans!). 1. Print off a coloring page of Our Lady of Guadalupe like this one and have your kids color it. 2. Cut out a hole for the neck in the bottom of the sack. Cut out the sides of the sack for the arms. Cut fringe around the bottom of the sack (optional). 3. 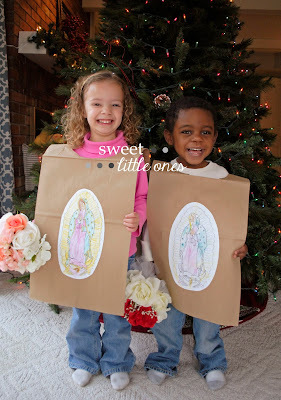 Then, cut out Our Lady of Guadalupe once the kids are done coloring. Glue it to the front of the sack. 4. Draw and color roses around Our Lady or hold some fake roses (we used old wedding bouquets). 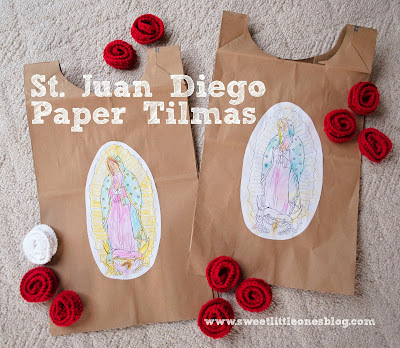 Now, your kids have tilmas just like St. Juan Diego! Next up - the play! 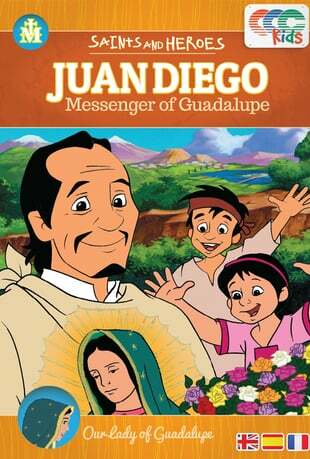 Because my kids love Juan Diego: Messenger of Guadalupe (affiliate link) from CCC of America, they know the story of Guadalupe very well. So of course, after making their own tilmas, they wanted to act it out! 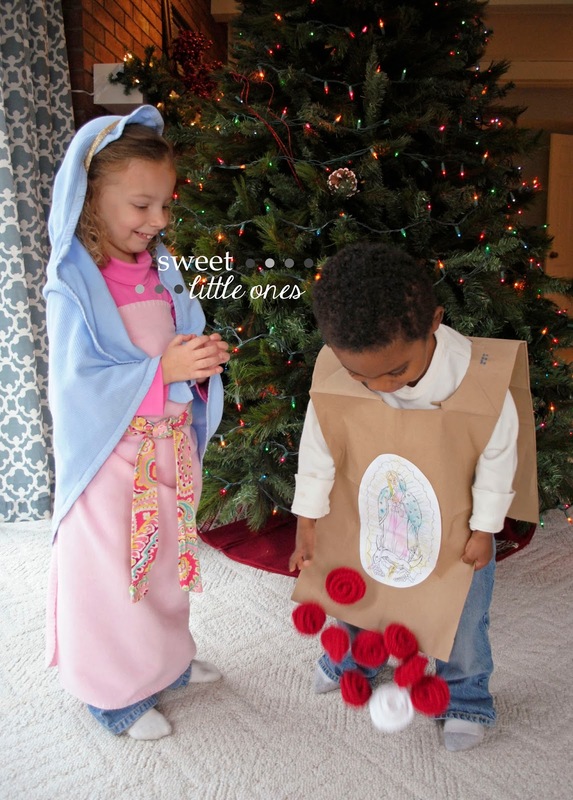 B wore his tilma, and J dressed up as Our Lady with pink and blue blankets and my pink fabric headband. 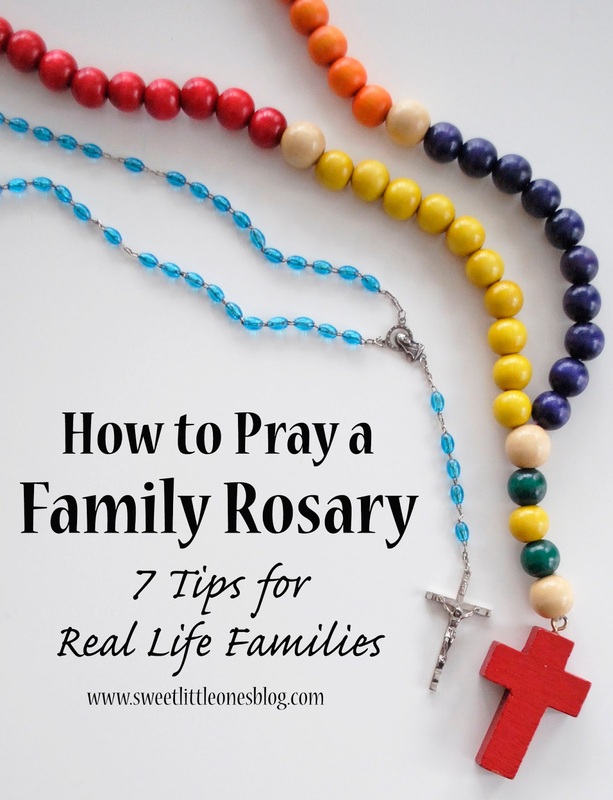 We also used our Rosary Roses (by Annery's Handmade) for the miracle flowers. The kids loved acting out the miracle of the roses! And to continue the celebration, we will have Mexican food for dinner for St. Juan Diego on December 9th and Our Lady of Guadalupe on the 12th. Beef and Bean Enchilada Casserole, Chips and Homemade Garden Salsa, Taco Chili...yum! Or maybe we'll really celebrate and just go out to our favorite Mexican restaurant instead! 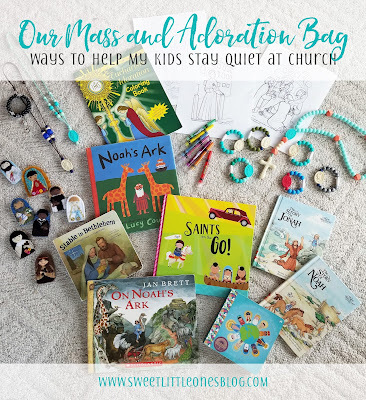 I also saw some other great ideas for a Guadalupe play date from Kendra over at Catholic All Year. 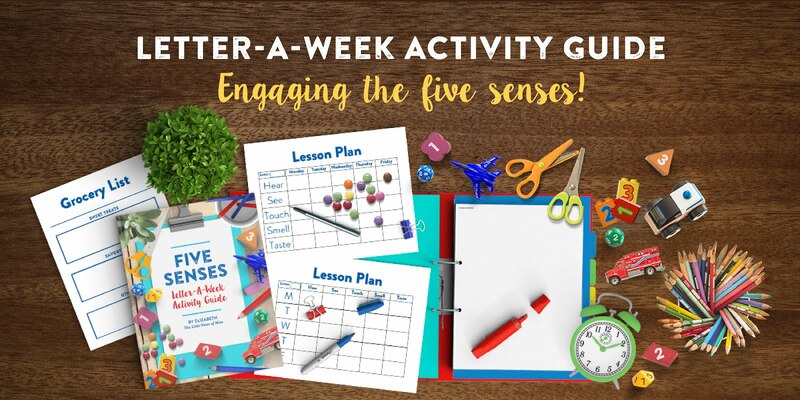 There are so many fun and easy ideas! 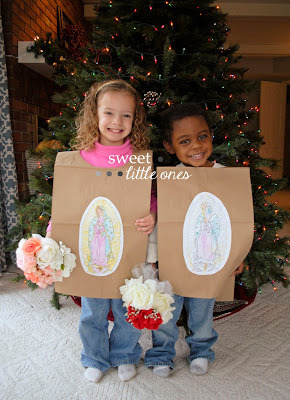 How does your family celebrate Our Lady of Guadalupe and St. Juan Diego? 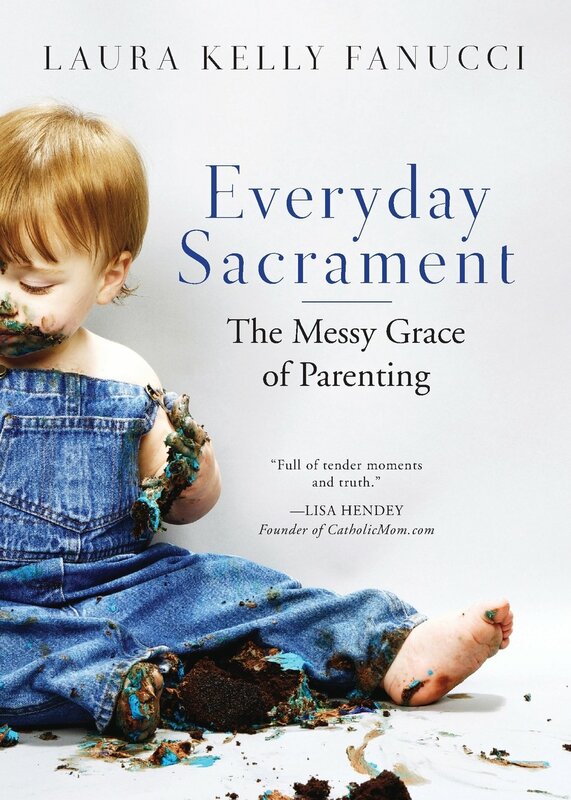 I love celebrating the feast days with my family! The saints teach us so much. They strove to lead holy lives for Christ in the midst of the same human struggles and weaknesses we all face everyday. I love reflecting on their lives and teaching our kids about them because in all of their words and actions, they point us to Christ. Who are your favorites? Happy Feast Days of St. Juan Diego and Our Lady of Guadalupe! May their faith-filled, loving examples help us in our journeys to grow closer to God everyday! 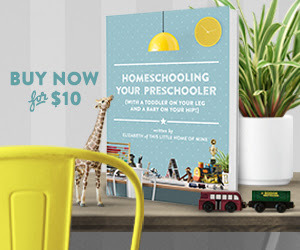 Below I have posted an affiliate link, which means that we may make a small commission if you make a purchase after clicking on this link; please see the disclosure page for more info. Like I mentioned above, we love Juan Diego: Messenger of Guadalupe! It tells the story of St. Juan Diego and Our Lady of Guadalupe in such a fun way for kids. 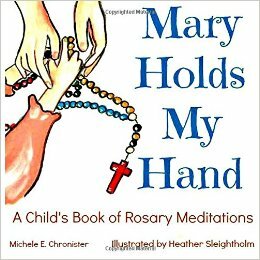 Plus, my kids absolutely looooove the Lady of the Roses song at the end. They always sing and dance along!